The first steps toward forming a "labour council" in Queensland was a notice in the then Brisbane Courier of 23 May 1885. The first meeting of interested union Secretaries was not held until 18 August with the formation of the new Brisbane Trades & Labor Council officially occurring on 1 September, 1885. Within four years the Labor Council had disbanded to make way for the Australian Labour Federation [ALF]. The ALF was more centralised than its' predecessor. Its inaugural meeting was held on 11 June 1889. The ALF, or more precisely, the Brisbane District Council of Australasian Labor Federation was formed on the eve of a range of industrial disputes, amongst them the printers industry wide strike of 1889, and the shearers and maritime workers strikes of the 1890s. The ALF survived during this period but with fewer affiliates. By 1914, however, the Brisbane District Council of Australasian Labor Federation found itself completely devoid of affiliates and was consequently dissolved. 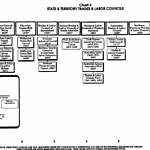 By mid-1914 the Brisbane Industrial Council was formed to address the vacuum left by the ALF. By March 1917 attempts were being explored to develop a closer unity between the Industrial Council and other bodies such as the Eight Hours Union and the Trades Hall Board. It took over twelve months, but in September 1918 a conference of 42 metropolitan unions adopted the Trades Hall amalgamation scheme. Difficulties continued for the fledgling body, with further negotiations between November 1921 and February 1922. These negotiations culminated in the establishment of the Trades and Labor Council of Queensland on 12 April 1922. There were 46 unions in attendance at the inaugural meeting. This body continued in name until 1993. At this time it was determined by the affiliated unions that the name of the Trades and Labor Council should be changed to more accurately reflect its role. The Australian Council of Trade Unions Queensland Branch [ACTUQ] was then formed. It was further renamed the Queensland Council of Unions in 1999 in what was considered to be a positive move to re-establish the identity of the Queensland trade union movement.